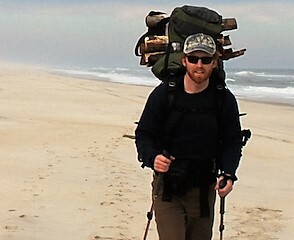 Patrick is a wildlife ecologist and conservationist from the Southern Appalachians. It’s been years since he’s harvested hickory nuts, smelled a magnolia blossom, or caught a Blue Ridge sunset from a grassy bald. He is currently pursuing his MSc in the Department of Zoology at the University of British Columbia, Vancouver. He has a B.A. in Anthropology from the College of William and Mary and has worked for nearly 10 years as an environmental consultant in the renewable energy industry across North America. His academic research will investigate the climate impacts on mammal connectivity and persistence in protected areas of British Columbia and Washington. He has additional interests in bat ecology and conservation of tropical systems. Patrick comes with previous experience as an officer of The Wildlife Society Renewable Energy Working Group and with the South Coast Bat Action Team. When he’s not working on wildlife projects, he’s hard at work with his wife figuring how to get their two daughters deeper into the backcountry.